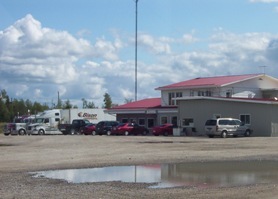 Driftwood is situated 80 kilometres north of Timmins city limits at the corner of Highway 11 and road 655. There are two homes in Driftwood. One is for sale. Otherwise there’s a big truckstop, which is a good place to get gas before Smooth Rock Falls. The truckstop also has showers and a restaurant that serves a decent breakfast. I used to stop there sometimes on my way from Timmins to Smooth Rock Falls. One of the servers was this pretty girl about my age with a nice ponytail and I always used to try to sit in her section. I’m sure I wasn’t the only one. Across from the truckstop there is a little alcove where the OPP hides to catch speeders, so beware if you’re continuing along Highway 11. This entry was posted in The Interior and tagged dot on the map by Highway11.ca Editor. Bookmark the permalink. It’s now Jan. 2016 and we (wife & I) just returned home (Kitchener) from Kapuskasing. That truck stop on highway 11 at 655 is no longer a truck stop. It’s gone! But I would be interested in knowing all which is known about a small unkempt cemetery on the north side of highway 11 right near the intersection of 11 & 655. close to Driftwood. There may be only 10 people buried there with only 6 or 7 markers. One marker in the form of a cross says “1880 Amanda. Meti 1937″ on the crossbar and “Vaillancourt” on the vertical bar. I find this very intriguing, but can’t find any more info on this place. I stopped yesterday and found this cemetery very interesting, did you find any more information. Driftwood was home to me for many years. It was a very busy village during the 70′s and 80′s. Mr Crawford’s store supplied us kids with candy, paid for from the bottles we collected along the highway. Wonderful place to grow up! My Parents got married in 1942 and Homesteaded on a piece of land on Hwy 11 at the DriftWood River! !